Heather and David created a menu for our class that was simple to make, yet flavorful and nutritious. Heather is a staunch supporter of cooking meals with ingredients that are in season whenever possible. By using fresh fruits, vegetables, and herbs in your meals you will be creating meals higher in nutritional value and flavor because you are getting plants in their prime. She collected her ingredients from the local farmers market and from her herb garden which included garlic cloves, rosy oblong radishes with white tips, fennel root, green beans, sage, bay leaves among other fresh tidbits. Their mouth-watering fragrance filled the kitchen setting the stage for a delicious lunch. From the moment we walked into their home, which is a converted horse barn on a working farm with a distinctly French stone exterior, David and Heather made us feel comfortable and at ease. Heather, gave us the choice of either having a “hands-on” class or the option of just sitting and taking notes. As she guided us through what we would be preparing for our 3-course lunch menu, we decided to get our hands dirty with real experience in the kitchen rather than take notes. The menu consisted of a deliciously smoked filet de canard (duckling filet), with a tangy citrus sauce, Pomme de Terre au fondant (braised potatoes), and steamed vegetables. To smoke the duckling filet, Heather showed us how to use a heavy-based pan lined with foil sprinkled with salt and seasonings on top of the foil. As the pan got hot, the seasonings started to send up thin wisps of pale smoke. The smoke added light, but flavorful depth to the duckling filet. We then created a citrus glaze that we drizzled over the filet. It was c’est délicieux! Thanks to Heather, I finally learned how to get that lovely crispy outer edge on potatoes without turning them to mush. First, use a hot cast iron pan with a bit of oil in the bottom. Next, don’t hover over them, poking or turning them every second. Set the potatoes on one end in the hot oil and cook until you see medium dark brown creeping up the edge of the potato. Then, turn the potato on its other end and repeat the process. Once they were adequately braised, but not cooked entirely, we added broth and fresh sage. We finished cooking the potatoes in the oven. For dessert, we created an incredible puff pastry sandwich with cream filling and fresh strawberries. The top was dusted with powdered sugar and then drizzled with chocolate syrup. The presentation was nothing short of what you would find in a five-star restaurant. The flavor was perfect, a delicate sweetness without being overbearingly heavy. They paired it perfectly with a light white wine. David taught us the importance of where to place each of the components of the meal on the plate. He also challenged us to think about the presentation on the plate when we served it. Do you want the main attraction in the center of the plate? Do you want hot next to cold? I know what you are thinking. I can hear some of you say, “what does it matter? I’m just going to eat it.” But, here it is – meals at home, simple or elaborate, can be an adventure the same as when you travel to a far-away destination. Regardless if you are hosting a small dinner party with a couple of friends or a romantic dinner for two to break up the monotony of the week, be creative. Add that sprig of fresh basil to the side of the plate before you serve it. Use colorful vegetables. Have fun – create a memory. Classes are small and held during certain months of the year. So, contact Heather and David now to make your reservations for the 2019 season! They also have gift cards available which make thoughtful gifts for the foodie in your life that may live or be going to the South of France. If you happen to be cruising along the Canal du Midi, they have a mooring location at GPS – 43.194940 N 2.482186 E, only about 7 ½ miles (12 km) from Carcassonne (La Cité Carcassonne) or 2 ½ miles (4 km) from the Trèbes port. They are located at mile 50 on the Canal du Midi and have a mooring that is ideal for those traveling by boat. Enjoy life – from beach bars to 5-stars explore and find your adventure. 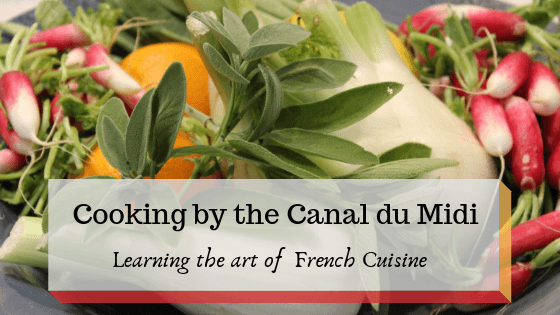 Thank you for reading this travel nugget of knowledge about learning the art of French cuisine from Cooking On The Canal du Midi. This article may contain affiliate links that do not affect you in any way but will allow Empty Nestopia to continue to bring you travel tidbits. This sounds like it was so much fun! I absolutely love cooking classes, and France would be such an amazing place to take one! That puff pastry looks delicious! It was fabulous! It was one of the highlights of our trip. Heather and David were so wonderful and friendly! Thank you for taking the time to read my article. Cheers!